Stripped of so many identifying features, Annihilation is something of an experience in partial sensory deprivation. Characters are identified by their job description (biologist, psychologist, anthropologist, surveyor), they are investigating someplace simply called Area X, the flora and the fauna are described but not labeled. Area X becomes something of an alien land, possibly in some sort of terraformed deep country region of Florida, possibly anywhere else. The location of Area X, at this point, is much less important than Area X itself. Annihilation features the twelfth expedition into Area X, a region cut off from the rest of the land some unknown number of years ago. There is some sort of barrier that must be crossed, a barrier that separates Area X from what might otherwise be called "the real world", or perhaps the "mundane world". Area X is a place that seems to drive people crazy, those that are able to cross the barrier, anyway. Members of previous expeditions have committed suicide, have murdered each other, have returned damaged in some way. The four women on this expedition know what came before, or, at least, they know what they have been told of what came before. Still they venture in to explore, to document, to discover. Area X is a great unknown, but after twelve expeditions, the information they have is still lacking. This is a legitimately unnerving novel. As the expedition begins to explore a structure close to the base camp that was not on any of their maps, the flat out weirdness of Area X begins to be revealed. With the spare descriptions lacking labels, Annihilation is a novel that exudes unease and fear. What is going on with Area X? What is the deal with that structure? While it is never clear why everyone seems to lose their mind after going into Area X, the sense of fear sets in immediately, as does the effects of Area X. The place is, for lack of a better term, wrong. Or, just "other". Perhaps it is only the lack of discrete names for everyday nature that adds to the lingering sense of doom that permeates Annihilation, but it may also be that when something is wrong, something is flat out wrong. Down the structure, the "tower", the Biologist begins to notice the passing of a creature she describes only as The Crawler, which like the job descriptions of the expedition members, is so generic that it adds to the atmosphere of the novel. So much is left to the imagination of the reader that there will be countless ideas as to what is going on, what the Crawler might look like, and everything in between. Yet, Annihilation is a novel written by an author in complete control. The writing is deliberate and VanderMeer has carefully constructed this setting, this place, and what he has revealed is exactly what is needed to tell the story. It is not everything that reader necessarily wants, because exclamations of a harried and confused "what the sweet hell..." that trails off in cautious awe and uneasy understanding are common. 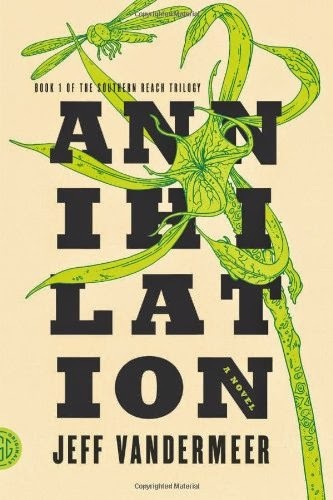 Annihilation is an impressive beginning to the Southern Reach trilogy and if the subsequent volumes are anywhere near as strong as this one, Jeff VanderMeer will have written something impressive indeed.